If you are an Eric Carle fan, then you are going to love this limited edition play and sleepwear collection! Also, Gymboree is hosting an in store event tomorrow, September 5th, from 10am-12pm! Families are invited to visit any one of the Gymboree retail locations (outlets excluded) for caterpillar crafts and story time. Parents can find printable coloring sheets and activities inspired by The World of Eric Carle! My favorite Eric Carle book would have to be The Grouchy Ladybug! What’s your favorite Eric Carle book? Love the stripy pants. they are extra cute and I would love to have a pair of my own. I've always bought Gymboree clothes, for my daughters and now my grandkids (and first GREAT-grandson due in November). They're cute and excellent quality. I've never bought anything at Gymboree but I do love Eric Carle and The Very Hungry Caterpillar. Gymboree is a new thing for me. But looking at the Eric Carle Collection that are available at Gymboree, it really looks so good for sure. My son's favorite book is the hungry caterpillar. The Very Hungry Caterpillar of course! 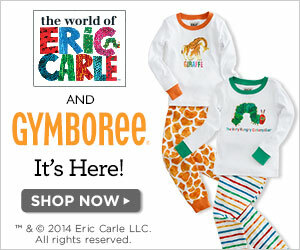 I not only love Gymboree, but so excited to see the Eric Carle collection. I think my daughters favorite is Brown Bear, Brown Bear, What Do You See!